This is the St Peter's brewery tap. A long way from Suffolk, but well worth the trip. This pub serves the full range of St Peter's beers on a rotation basis. Usually there are six beers or so on the hand pumps and the rest in bottles. Not a large pub, there is a beer garden out front on the pavement. Once inside space is at a premium, so get there early. The front part of the pub has some tables and chairs on a bare wooden floor. This area leads through to the bar which is on the right. It's not large and everything looks as though it hasn't been updated since the 1800s. Some more seating is past the bar, but not much. There is also a balcony seating area which is high but small - you will see what I mean. Lots of wood about and candles in old St Peter's bottles. 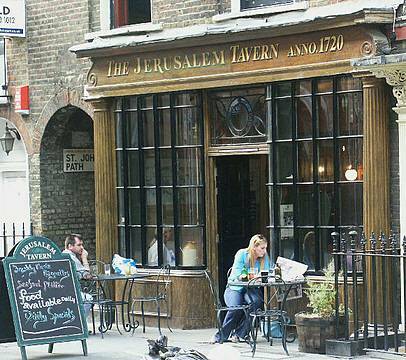 The pub dates back to 1720 and has a relaxed atmosphere. Alas it's not open at the weekends as are many London pubs, but it is well worth seeking out during the week. Food is served but only at lunchtimes and it is not a wide menu. For winter there is a real fire to keep you warm. The local tube stop is Farringdon. One final thing, the toilets are downstairs, not good for the disabled.